The other day, someone was telling me how they had been stuck in their schtick. They didn’t like it but they also couldn’t get out of it, until someone helped them dismantle it. Afterwards they felt lighthearted and free. It’s reminiscent of how most people feel, going about their daily lives, feeling dissatisfied, discontent. They know they’re stuck but feel powerless to get unstuck. Until they experience a shift in Consciousness, and open to a whole new experience of expansion and freedom. Our bodies are our vehicles on this planet. It’s how we get to experience physical reality, and all the delicious sensations associated with it. When we’re operating unconsciously, our bodies become self driving cars. They’re moving through their routines, they’re picking up all sorts of impressions and having all sorts of reactions. If you look around you, and if you look at the news, reality is filled with self driving cars, with very little Consciousness occupying them. And, at the same time, there’s an increasing amount of Consciousness coming into form nowadays. Which means all those cars are actually experiencing more Consciousness than ever before. Which is why there seems to be greater collective freedom and empowerment AND greater outrage and atrocities than ever before. It may seem like self driving cars don’t *want* Consciousness occupying them. They want to keep careening about, smashing into dead ends and each other. And yet, when Consciousness fully embodies, they calm down, feel happy, feel taken care of. 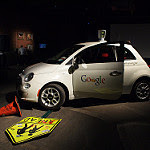 Self driving cars think they won’t get what they want if they’re not driving themselves. But what really happens is they get everything they need, and more. When you start to steer as Consciousness, the journey looks very, very different. Instead of chasing after things that remain forever out of reach, or feel hollow to attain, reality starts to reorganize in your favor. What you want starts to appear in your life, without any effort. Instead of a winning lotto ticket, you have a prosperous and abundant life. It *feels* like you’ve won the lotto. Instead of the perfect job, you have a rich and rewarding career. Instead of your ideal soul mate, you have fulfilling emotional partnership. All you have to do is take your vehicle off of autopilot. Shift your perspective from your personality to yourself as Consciousness. Navigating life as your own greater Consciousness is a very subtle, but profound, inner realignment. When you do this, your life unfolds beyond your mind’s wildest imagination. Try this for a week and see what happens!